The latest assumption surrounding Jon Snow and Daenerys are too dark but with a very good intention for the 'Game of Thrones' world. Before it was even revealed, a lot assumed that the R+L = J theory was, indeed, real. And now that HBO confirmed that Jon Snow (Kit Harington) is actually the son of Ned Stark’s (Sean Bean) sister, Lyanna Stark, and Rhaegar Targaryen, it is a big question how the King of the North will know the truth. It has been known that Bran Stark (Isaac Hempstead Wright) knows the truth about his big brother’s identity. However, it seems like the newly revealed teaser snaps of "Game of Thrones" Season 7 hinted that he will find it out himself. There are some swirling speculations that Jon Snow would learn the truth about his real identity and parentage in the Winterfell crypts. It has been known that there are empty tombs inside the burial chamber for the Starks family and these blank graves are said to have some proofs that will prove his true personality left by Ned himself. In fact, in George R.R. Martin’s book series, “A Song of Ice and Fire,” which the show is based, he has a series of dreams about the secrets of the crypt. This is even supported by the new “Game of Thrones” Season 7 teaser photo revealed by HBO recently. In the snap, the Lord Commander of the Night’s Watch can be seen standing in what-seems-to-be the Winterfell crypt. 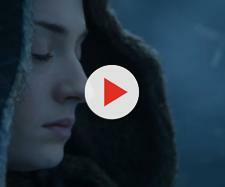 Although the claim is not yet proven to be true, the settings and the lighting of the picture are similar to the scene where Sansa Stark (Sophie Turner) and Petyr Baelish (Aidan Gillen) are seen talking inside the cellar. Aside from Jon Snow’s photograph, another “Game of Thrones” Season 7 teaser photo is being connected to one more theory. Samwell Tarly (John Bradley-West) and Gilly (Hannah Murray) are seen reading a book about Azor Ahai in a library. He is the legendary hero who has to be reborn to save the world of “Game of Thrones” from darkness and some say he is Jon Snow. However, for him to be Azor Ahai, he has to kill Daenerys Targaryen (Emilia Clarke) for the dark prophecy to be true. To be able to forge his sword called Lightbringer, Azor Ahai had to pierce his wife named Nissa Nissa. This would be the only way for her soul to be installed into the foil that would make the weapon be alive. Hence, there are strong assumptions that this would be Jon Snow and Daenerys, especially if the rumors about the two are going to hook up will happen. “Game of Thrones” Season 7 is set to air on July 16 on HBO.